The Contemporary Pet thanks Katie Kensey for today’s article. She blogs about her dogs and their lives in the agility circuit at Adventures With Wolfpack. You can read more about Katie and the Wolfpack by going to our About page and clicking on Contributors. With the wealth of options of dog sports to participate in, it’s often difficult to know which sports your dog will like. Some dogs take right away to sports, and for others the learning process can take much longer. Furthermore, the personality of a dog can affect the sports it may excel in. While it may seem logical that a high-energy dog would be most suited for a high-energy sport, such as agility, this is not always the case. There are often other factors in play that delve deeper than an owner’s intuition – sometimes the only way to know is to give it a try. Additionally, just because a dog doesn’t demonstrate certain personality traits doesn’t necessarily mean that the dog doesn’t have them. It can be a good idea to choose dog sports that might help improve certain traits, such as focus. However, there are some indicators that you can look for that might help steer you in the right direction. We may not be experts on every dog sport, but we have participated in many and have learned a great deal along the way. Moreover, there are numerous personality and character traits that dogs can exhibit, but there are some that we think are most important for dog sports – here they are. Think of energy as your dog’s ability to go-go-go. Sports that take advantage of a dog’s high energy levels not only encourage a dog to be bouncing off the walls, but require it. Even though energy may come naturally for some dogs, there is quite a bit of work that an owner needs to do to maintain that energy. Keeping the dog’s weight in check, feeding a high-protein diet, and keeping the dog engaged in a variety of activities will help build energy and endurance. 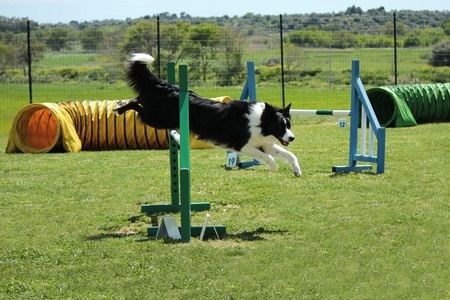 Whether you’re looking to increase a dog’s energy, or provide an outlet for it, look into sports such as agility, dock diving, flyball, and coursing. Drive is your dog’s desire to engage in an activity, including the level of effort it exhibits. It is critical that a dog has high drive in order to excel in a variety of sports – a highly energetic dog that has no desire to jump off a dock or go through a tunnel will struggle to enjoy those sports. Fortunately, drive is something that a dog can naturally pick up along the way during training. As a dog learns the basics of a sport and starts to understand the objectives, you will likely notice a steady increase in drive. 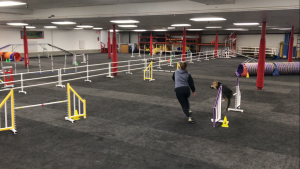 Nonetheless, drive plays a critical role in a dog’s success in agility, dock diving, nose work, barn hunt, and many more. Really, an argument can be made that drive is important for any dog sport, whether it’s highly athletic or not. Food and prey motivation is a measure of how much work your dog is willing to do for a treat or to get to a prey animal. I think that this is a personality trait that is generally misunderstood by a lot of dog owners – most of us naturally think that these motivations are only significant in dogs that have been bred specifically for these tasks (e.g. basset hounds with scent tracking, or terriers with rodents). 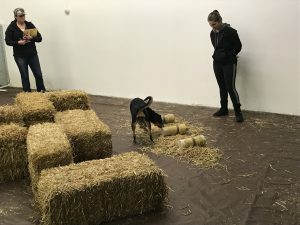 While it’s certainly true that these dogs have natural proclivities for their prescribed tasks, it doesn’t necessarily mean that other dogs can’t also be successful. If you find that your dog goes completely nuts over food, treats, or animals in the backyard, you might want to look into sports such as nose work, barn hunt, earthdog, tracking, or coursing. Focus is not just about how well your dog concentrates on the task at hand, but it’s also about self-control. This could either involve focusing on things in the dog’s environment, or focusing on the commands and signals coming from a handler. While some dogs naturally have better focus than others, most dogs will learn to focus as they age and gain more experience doing certain activities. Additionally, following proper training and guidance from an instructor will ensure your dog has the right motivation to focus on what it’s supposed to be doing. Much like drive, focus is arguably fundamental with every sport. However, sports that particularly exercise a dog’s ability to focus include obedience, rally, and agility. Independence is a dog’s ability to engage in tasks that take the dog away from its handler and to primarily work alone. Dogs have been bred for centuries to live and die by their owners, but everyone knows a clingy dog when they see one. To maintain a healthy balance of independence or take advantage of a dog’s natural independence, look into sports such as nose work, tracking, and coursing. By contrast, dependence is the exact opposite – how much your dog looks to its owner/handler for direction. Independent dogs can be very troublesome if they’ve learned to disregard their handler’s direction. Also, a dog with a natural inclination to depend on its owner can find great success in sports that emphasize that. Sports that foster a dog’s dependence on its owner include obedience, rally, and agility (although agility requires a fair amount of independence as well). An overarching trait that’s important for all dog sports and activities is confidence. When we, as humans, learn to drive a car, it’s not uncommon to feel nervous, scared, and overwhelmed. However, as we get more experience we become more confident and comfortable, and those emotions tend to go away. Dogs are the same way – it usually takes time for a dog to develop its confidence, and until that happens it won’t be operating at full strength. A dog’s confidence varies by activity as well. You may find that your dog is at peak energy and drive while running agility, but in the rally ring it’s unsure and shuts down. This makes it all the more important to observe your dog’s confidence level and make sure you do all that you can to reassure it if you think it’s feeling unsure. This might involve simple exercises with the dog to give it an easy win, or offering overwhelming amounts of praise. In every sport a dog participates in, the greater their confidence level in what they’re doing, the greater their success will be in the sport. The best thing about participating in sports with your dog is that even if your dog doesn’t exhibit a great deal of one trait from the get-go, this can be developed in a sport that encourages that trait. For example, if you’re looking to improve your dogs’ focus, obedience is an excellent sport to try – it encourages the dog to focus on you, and exercise impulse control while participating. The most important thing to remember as you try different sports with your dog is to be patient with them; they are in the learning process and need your full support to be successful. There is nothing more rewarding than seeing your dog gain confidence in the sport they’re participating in, and start to really enjoy it. We highly recommend trying out different sports with your dog no matter its personality traits. With patience, anything is possible. Just like kids, different dogs enjoy different activities. Trying out a number of different sports to find the right one for your dog will be rewarding for everyone.